Like many of you, I find myself getting into a food rut. What should I cook for dinner?! Too often no one in my house offers an answer. We do a couple smaller grocery runs a week and I have to stay on top of meal planning in order to keep the meals healthy and the grocery bills down. So I wanted to share 5 healthy (and pretty easy) recipes we make on a regular basis that you might want to try. You may have heard me mention that my husband has dabbled in veganism. His idol – Tom Brady eats predominately vegan and Chris values his own fitness performance. It wasn’t until his mid 30’s that Chris realized he was lactose intolerant. The GAS!!!! OMG – dairy puts a bomb in his body that slowly releases toxic fumes until the explosion. So vegan meals also interested him because he was a bit embarrassed (unfortunately not in front of me) when he would be so stinky in public. The first couple recipes are vegan! That said – we are not vegan….we are parents of vegetable haters trying to set a good example by eating lots of vegetables – and sometimes animal products as well. I make this vegan taco meat recipe almost every week. It’s so good with salted/smashed avocado and cilantro. I put it on almond flour tortillas for dinner and then eat the taco meat with a whole avocado and cilantro the next day for lunch. I have simplified the recipe and shared a quick video tutorial in my saved stories on Instagram. This is my husband’s go-to recipe! One of my best friends has been vegan for quite a while and she has fallen in love with it as well. I don’t eat a lot of grain, but I find serving it over cauliflower rice alone it just doesn’t cut it, so we mix the cauliflower rice with some organic white or brown rice and it’s SO filling. I add a lot of cilantro to garnish the vegan butter chickpeas but I know not everyone loves cilantro. Do you? Daneille Walker is one of my favorite foodies! 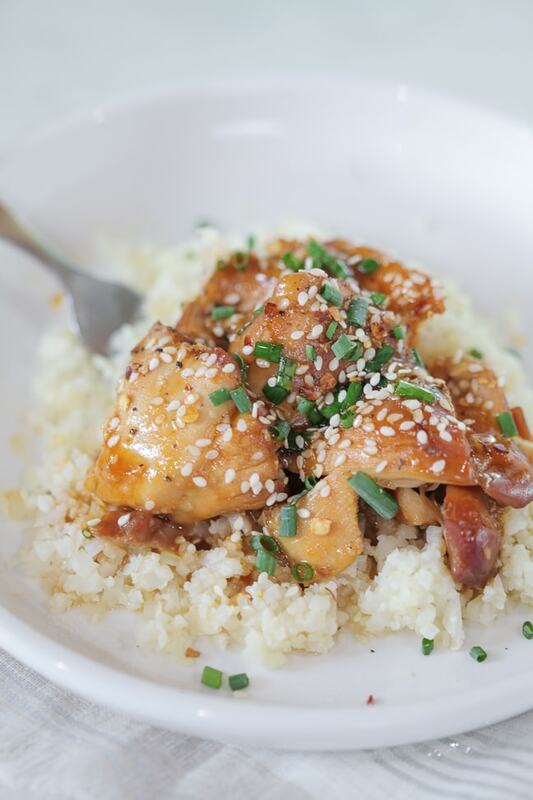 On her website she shares an easy video tutorial for my favorite Instant Pot recipe – her Paleo Sesame Orange Chicken. She just released a new cookbook and one of the recipes inside (Cauli Couscous) is a new favorite. The book is called “Eat What You Love” and I’ve heard the queso recipe is also amazing but I’ve yet to try it. I highly recommend the Trader Joe’s vegan queso for those that don’t love to cook. I serve this chicken over cauliflower rice (I buy the frozen packs at Trader Joe’s or Costco) and it’s quick and delicious. There’s something I love about a physical cookbook. It’s great being able to save recipes on my Pinterest boards, but it can be tricky prepping food while going back and forth to get my iPhone, which is always on standby, to show me the recipe again. If I’m cooking chicken – forget it – my phone is a germ fest without me getting raw chicken juice on it. My favorite recipe from Danielle Walker’s newest cookbook is the cauli couscous which incorporates flavors I’d never think to pair like: lemon zest, basil, dried cherries, and cilantro. 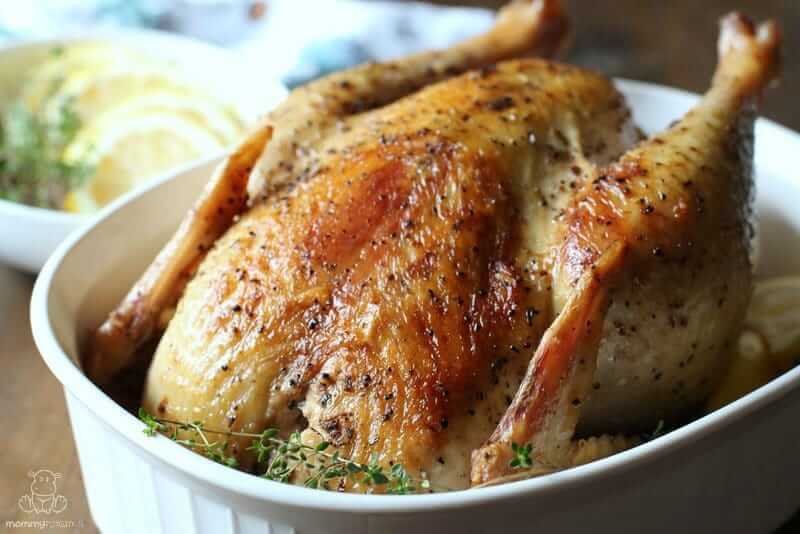 Another easy recipe is for a whole chicken in the Instant Pot. I add carrots, garlic, and celery around the chicken before I seal the Instant Pot and use and hand blender to turn the drippings and cooked veggies at the bottom of the instant pot into an easy gravy. I serve this over mashed cauliflower. You can cheat and buy the pre-made made cauliflower- but all the brands I’ve found contain dairy which doesn’t help my lactose intolerant hubby. Once we finish dinner I put the remaining chicken/carcass back in the instant pot on slow cooker mode to make bone broth for soup the next day. I feel fortunate to live close to a Trader Joe’s because their freezer section makes it possible to grab something healthy from my freezer in a pinch! I love their frozen cauliflower fried rice. When we are eating more carbs I mix in some quinoa to give it more bulk (and additional sesame oil and Tamari or coconut aminos) and add whatever we have on hand for protein. Leftover chicken or salted cashews are quick mix-ins I like, and I add a bunch of fresh cilantro which I usually have on hand. I’ve also made this Sesame Cauliflower recipe and put that over the pre-made cauliflower rice I mentioned above. The sesame cauliflower is easy to prepare and I toned down the sweetness just a bit. Summer seems like a distant memory, but in the Summer I love to (have my husband) grill boneless chicken thighs. I find thighs are just so much more tender than breasts and I simmer down a sauce for the chicken that is one part no-sugar added orange marmalade (or jelly, I’m not sure the difference?) to one part balsamic vinegar. Cooking it down on the stove top makes it like a glaze for the chicken and it’s DELISH!! You can cook the chicken inside but I prefer a bit of (unhealthy) grill char on mine. Thanks so much for stopping by! I’d love to hear from you guys what some of your favorite healthy recipes are. Please drop a comment below so everyone can see.